The Highlands is one of Europe’s most unspoilt scenic regions, a rugged landscape of imposing mountain ranges, sheltered fertile glens and scattered offshore islands. Shaped over aeons by geological faults, scouring glaciers and Atlantic weather, the region offers an unsurpassed variety of routes, often with colourful and romantic historical connections for walkers of all levels. Each of our three groups in Highlands offer full and vaired walk programmes all year round. We have something for everyone and offer an amazing opportunity to discover new places and expore some of the most stunning landscapes in Scotland on foot. All walks are led by experienced walk leaders with local information and knowledge. We extend a very warm welcome to all new walkers, visitors and guests. You can walk with any group so if you think you might enjoy walking with us, please have a look at our list of walks, choose a walk, get in touch and come along! Walks every week, alternating Saturday/Sunday. Mountain, forest, lochside and coastal walks of varying grade. You'll find a warm welcome awaits you! Our area has the best walking in the UK. It includes Ben Nevis, spectacular Glen Coe and the islands of Skye, Mull, Rum and Eigg. We walk two days every week.Thursdays and alternate Sat/Sun. 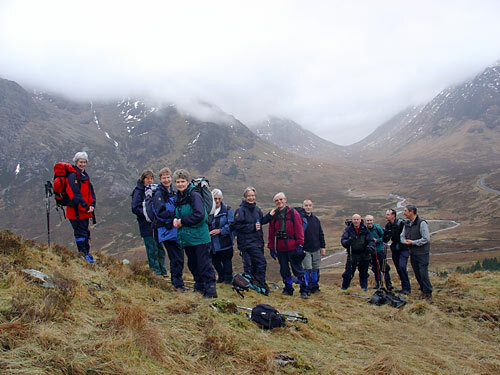 Join the Ramblers and become a member of Highland & Islands Area.